(Newser) – While China and the US go back and forth on tariffs here on Earth, the former is forging ahead with a more celestial grand plan. 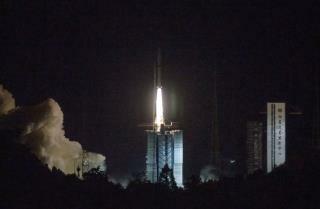 In what it hopes will eventually nab it a world first, China on Monday launched its Queqiao (aka "Magpie Bridge") satellite, per state media, putting it one step closer to being the first country to land on the so-called dark side of the moon, the Guardian reports. So far, no probe has ever successfully made it to the part of the moon we never get to see, mainly because of communications issues: Signals from a probe on the dark side wouldn't make it all the way back to Earth due to interference from moon rock. By entering the moon's orbit about 282,000 miles from Earth, however, Queqiao will serve as a middleman between the Chang'e 4 lander-rover China plans to send to the dark side later this year and stations back on Earth, Space.com notes. The dark side of the moon is full of aliens and alien bases, see YouTube. That’s why we haven’t returned. They said “GIT”!! !